The authority of local government is handsomely symbolized in Surry County’s Neoclassical courthouse, the dominant landmark of this crossroads county seat. 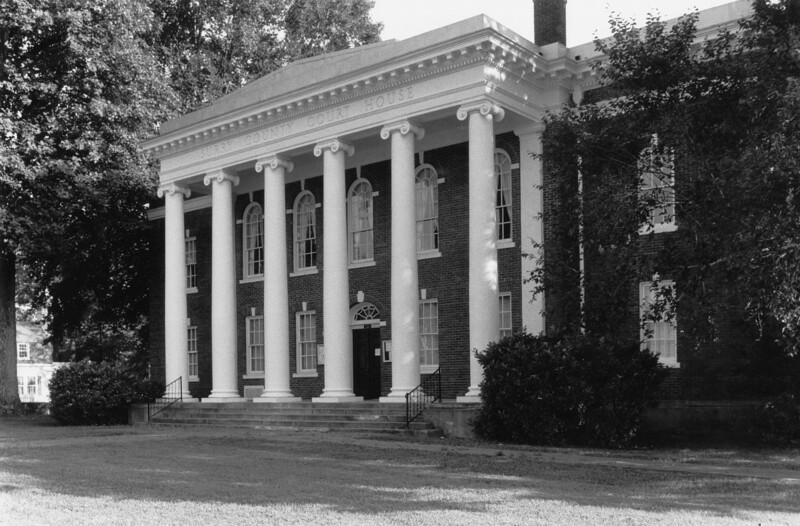 The two-story brick building, highlighted by a stately Ionic portico, was erected in 1923 after a fire destroyed a 1907 courthouse on the same site. Designed by architect G. R. Berryman to resemble the building which it replaced, the courthouse is the seventh structure to serve the county since its formation in 1652. A small clerk’s office building erected in 1825-26, stands on the edge of the tree-shaded courthouse square. Several later small structures housing county offices are clustered around the courthouse. A 1909 monument to the county’s Confederate dead completes this classic Virginia county-seat grouping.